Reading together is one of our families favorite pass times. Some of the greatest memories that I (Carlie) have as a young girl are sitting in my Grandma Jean’s lap as she would read book after book to me. Because my grandma was a teacher it seemed like she had countless books on every subject and every holiday. As an adult I’ve been able to pass on some of my favorite books and my children love them just as much as I do! 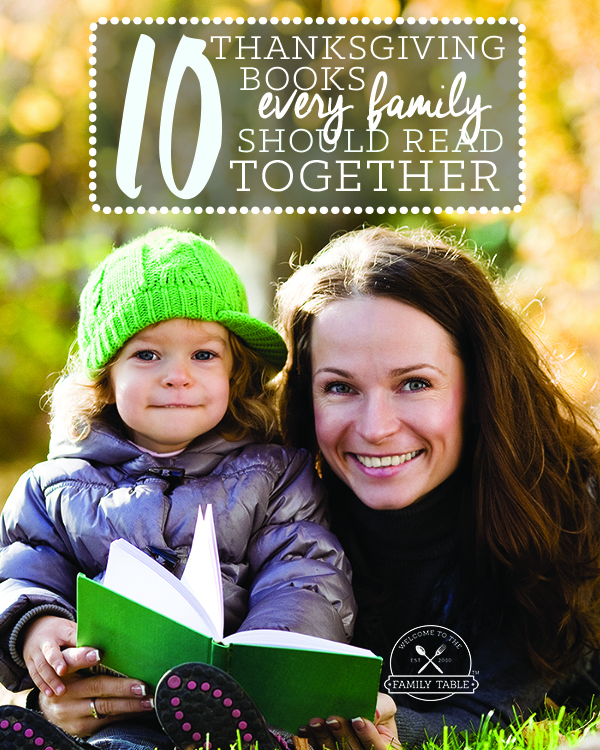 Today I am sharing 10 of our family’s favorite Thanksgiving books. We will definitely be sitting together and reading each of these books during the month of November and hope that you may find some new ones to read with your family, too! The Pilgrims’ first Thanksgiving lasted three whole days. Ann McGovern’s simple text introduces children to the struggles of the Pilgrims during their first year at Plymouth Colony and the events leading to the historic occasion we celebrate today – THANKSGIVING. As Mama and Lil Pup explore, she reminds him that God is the giver of all good things. Lil Pup learns that even when something fun comes to an end; his heart can be thankful when he sets his mind on the best things in his life. This inviting addition to the best-selling God Gave Us series, helps little ones to understand how giving thanks warms hearts and brings joy. This classic tale is a wonderful Thanksgiving story based on 19th-century New England life. In addition to the beautiful illustrations, this classic book has the sheet music to sing and play along to! As soon as Maggie’s grandma and grandpa get the turkey in the oven, bright and early on Thanksgiving morning, the guests arrive and the commotion begins: glamorous aunts, crying babies, acrobatic cousins, strange dogs, mysterious gifts, romance, friendships, “yackety-yak”ing and, of course, lots of wonderful food and fun. Celebrate food and family with this heartwarming Thanksgiving picture book. We will share the risen bread. / Our made-with-love Thanksgiving spread. / Grateful to be warm and fed. / We will share the bread. In this spirited ode to the holiday, set at the turn of the twentieth century, a large family works together to make their special meal. Mama prepares the turkey, Daddy tends the fire, Sister kneads, and Brother bastes. Everyone—from Grandma and Grandpa to the littlest baby—has a special job to do. Told in spare, rhythmic verse and lively illustrations, Sharing the Bread is a perfect read-aloud to celebrate the Thanksgiving tradition. Thanksgiving might have started with a jubilant feast on Plymouth’s shore. But by the 1800s America’s observance was waning. None of the presidents nor Congress sought to revive the holiday. And so one invincible “lady editor” name Sarah Hale took it upon herself to rewrite the recipe for Thanksgiving as we know it today. This is an inspirational, historical, all-out boisterous tale about perseverance and belief: In 1863 Hale’s thirty-five years of petitioning and orations got Abraham Lincoln thinking. He signed the Thanksgiving Proclamation that very year, declaring it a national holiday. This story is a tribute to Hale, her fellow campaigners, and to the amendable government that affords citizens the power to make the world a better place! Mr. and Mrs. Moose invite all their animal friends for Thanksgiving dinner and the only one missing is Turkey. When they set out to find him, Turkey is quaking with fear because he doesn’t realize that his hosts want him at their table, not on it.